I was tired of trying to cook in two places. I would be cooking my main course on the grill and then running into the kitchen to make the rest of the meal. And especially when I had guests over, I wanted to be outside visiting so I started to collect, refine and adapt recipes that would allow me to make an entire meal on the grill alone. Nothing says summer like a barbecue. But if you’re tired of burgers and need some inspiration, then look no further. You’ll find new marinades and interesting flavors to transform your grilled meats and vegetables from good to truly remarkable – sometimes without any more effort. All the recipes are made for the grill so you can spend your time outside cooking rather than inside the kitchen. I love outdoor cooking. The grill magically transforms the food and cooking outdoors is a nice break from the kitchen. But I believe the barbecue should be fun, quick and easy too. And it isn’t fun to always be running to the kitchen to prepare sides. 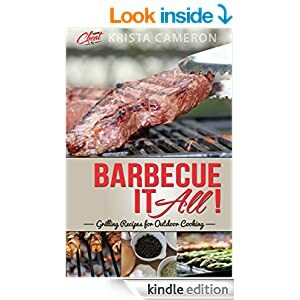 So, I created this barbecue book so that you can prepare an entire meal on the barbecue. It includes starters, salads, mains, sides and desserts. Some are super simple and they’re all delicious. Everyone needs to eat. So why not eat, delicious, healthy (mostly) food all the time. My best advice is to just do it. Be passionate about the food that you’re writing about but start writing and sharing your success in the kitchen. Sharing makes all of us better cooks. When I cook I can’t help myself I cheat all the time. I cheat to save time. I cheat to save money. I cheat to maximize the flavor. My cheats are all about finding shortcuts to help get delicious, homemade meals on the table. I started cooking at a young age by “helping” my mom in the kitchen. I recalls many disasters and the patience and skill her mom deployed to rescue my attempts. After I left home, I continued to learn by trial and error and as I became more proficient at cooking I continued to expand my knowledge and efficiency in the kitchen.